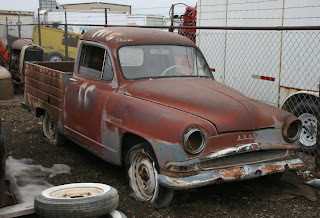 In my daily e-trip around the world in search of Simcas on craigslist and eBay, I found what is without a doubt the coolest vehicle ever offered for sale - a 1957 Simca Aronde Pickup. And it came that way from the factory! Why don't I own this vehicle already? This truck, if you feel comfortable calling it that, inspires me to make my own vineyard just to put it to use by harvesting the grapes in a beret and placing each basket in the remaining portions of the bed. The glass master cylinder reservoir is a nice touch. So is the fact that the valve cover is even labeled with the increment of time it takes to pop the motor while pulling a light implement or garden trailer. Check it out here, then bid.